Inspired by the Black Lives Matter movement, The Hate U Give is about sixteen-year-old Starr who lives in the ghetto of Garden Heights and is the sole witness to the fatal shooting of her unarmed best friend, Khalil, by a police officer. The novel is set in two different worlds: Garden Heights, where Starr and her family live, and Williamson, Starr’s privileged, posh high school. She acts differently in each location and we learn that she doesn’t really feel like she belongs at the school. Her friends and her boyfriend are wealthy and very privileged and she feels out of place. They don’t understand her world. They don’t understand what it’s like to grow up in the ghetto with hardly any money and to work in your father’s store every weekend to earn some money. Her boyfriend, Chris, is sweet and means well, but at times is so caught up in his own Williamson world that he doesn’t understand how different he and Starr actually are. For me, there were three dominant themes in the book: racism, family, and identity. The Hate U Give is powerful, necessary, shocking but also really eye-opening. It shines a light on what prejudice is like in the 21st century. The book may be fictional, but this storyline has happened many times in real life: a black kid is unarmed, innocent, and is shot dead by a white policeman. The cop believes (or claims to believe) that the kid was armed, but he wasn’t. And so begins a court case to determine who is telling the truth. 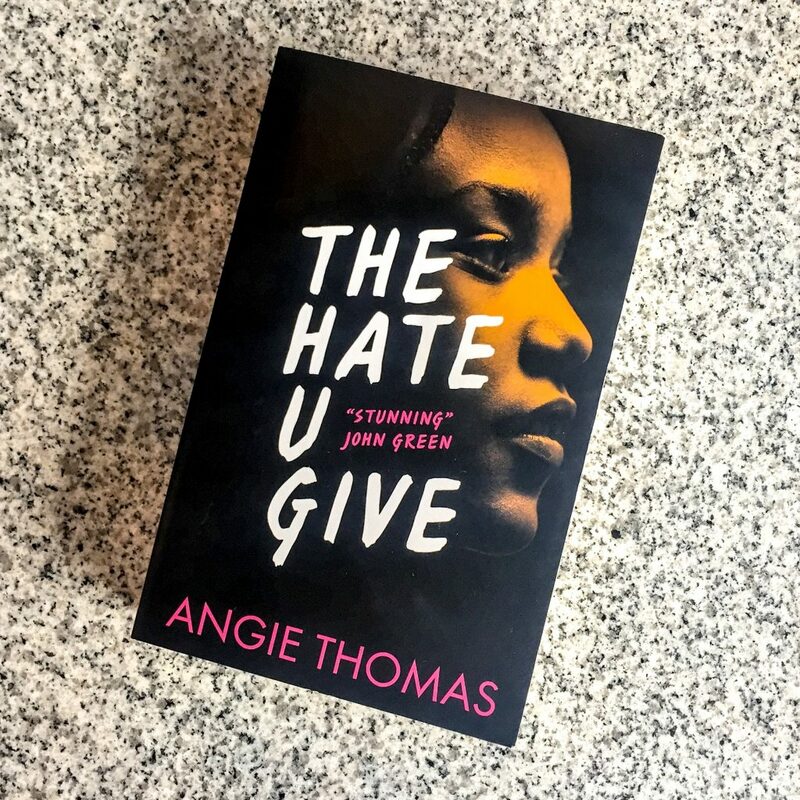 This is such a topical issue at the moment, and Angie Thomas has highlighted how racism can be overlooked and how assumptions can be made that undermine people of colour. “When I was twelve, my parents had two talks with me. One was the usual birds and bees. The other talk was about what to do if a cop stopped me. Starr is afraid to tell the truth. She was in the car with Khalil when he was shot, and she’s the only witness. But the police don’t believe her story, and the media are painting Khalil to be a drug dealer who deserved to be shot. The cop’s family are being interviewed on the TV, acting innocent and worthy of sympathy. Starr doesn’t know what to do, and the reader grows increasingly frustrated and angry at the racism towards Starr and her family. This story may be fiction, but it represents very real racism in society today. What a beautiful, beautiful family that Starr has. Her parents are compassionate, caring, supportive and they’re very present in her life. Unlike a lot of young adult fiction, Starr’s parents are in most scenes in the book. They help her deal with the loss of Khalil and they encourage her when she decides to speak to the police about what happened. Starr is also close with her extended family, in particular Uncle Carlos, who took care of her when she was younger and Starr’s dad was in prison for three years. Uncle Carlos acts as a second father figure to her. It’s beautiful to see that Starr has support coming from so many different people in her family. As the reader, you’d think that Starr’s boyfriend and her friends would be the closest people her life, but this book actually shows that it’s her family who she’s closest with. It’s so important for a teenager to feel like they have a support system and Starr really has that in this novel. Her mother and father are so encouraging and I loved that Angie was able to emphasise their closeness and their devotion to protecting their child. In the book, Starr feels like she’s two different people. She acts a certain way around her family and friends in Garden Heights, but differently around her school friends and her boyfriend Chris at Williamson. Starr doesn’t want her friends to know that her friend Khalil was the boy who got murdered. She thinks they won’t understand and she thinks they’ll make racist comments. And they do. After Khalil dies and the police decide not to investigate the office who killed him, most of Starr’s classmates organise a protest. It seems noble at first, but really, the only reason they’re doing it is so they can get out of class. Throughout the novel, Starr’s friend Hailey makes subtle comments and mutterings that some people perhaps wouldn’t consider to be racist. But they are racist, and Starr builds up the courage to confront her. This illustrates the systemic racism that undermines Starr’s world and the reader begins to understand what it’s like for people of colour in a society where racism is so prevalent. In addition to these three themes in the book, Angie Thomas has illustrated a very realistic premise with very realistic characters. The dialect in the book represents the dialect in places like Garden Heights, with shortened words and common phrases/words. You can really hear the characters when you’re reading the dialogue, and this is one of the strongest linguistic elements in The Hate U Give. I can’t praise this book enough. It’s relevant, necessary, heartbreaking. If you’re looking for a book to read that perfectly illustrates racism in the 21st century and what that is like for a person of colour, then this is the book you should pick up. It really is such a fantastic book 🙂 It’s hard to fault it.